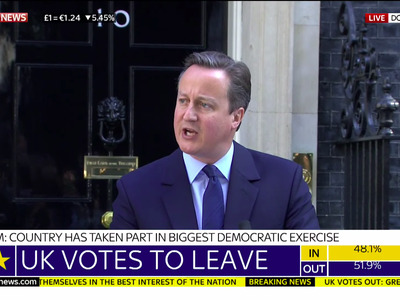 Sky NewsPrime Minister David Cameron, resigning on Friday after the EU referendum vote. The House of Commons and the House Lords could block Britain leaving the European Union because there is no mandate on how it should be done, a constitutional expert has told Business Insider. “The detail of a Brexit is totally unclear,” Dr Peter Catterall of Westminster University said in a Facebook Live interview with Lianna Brinded at Business Insider. So what does this mean? Quite simply, that in a parliamentary constitution, elected MPs have every right to ignore the outcome of a referendum. “It is perfectly legitimate for MPs in parliament on the Remain side to say that they don’t reject leaving the EU but we reject the terms on which you are trying to do it,” says Dr Catterall. And what about Scotland, where residents voted overwhelmingly to Remain (62% versus 38% for Leave) and Nicola Sturgeon hinted at another independence referendum? “She cannot block Brexit, but what she’s doing is [more clever]. She’s the only politician who sounds like she has a plan. She’s sending out a signal to the Scottish people, to Westminster and Brussels. Risk is that the EU, particularly the Spanish, will not like to see Scotland succeed because it might send a message to the Catalonians,” says Dr Catterall.